Scarves are colorful wardrobe accessories that sometimes defy our best organizational attempts. 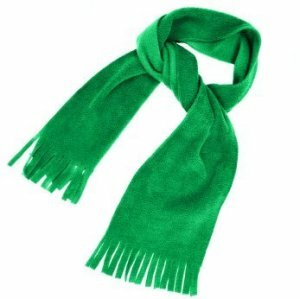 This is a guide about organizing scarves. Scarves are all the rage now and I wear them almost daily. I have always had a scarf collection, but with the fashion, I like to keep them handy. I hang them on wire clothes hangers that I have bent to form an "O" shape. I hang my scarves on them and then hang the wire scarf hangers on the wall. It makes them much easier to locate. I have amassed so many beautiful scarves. 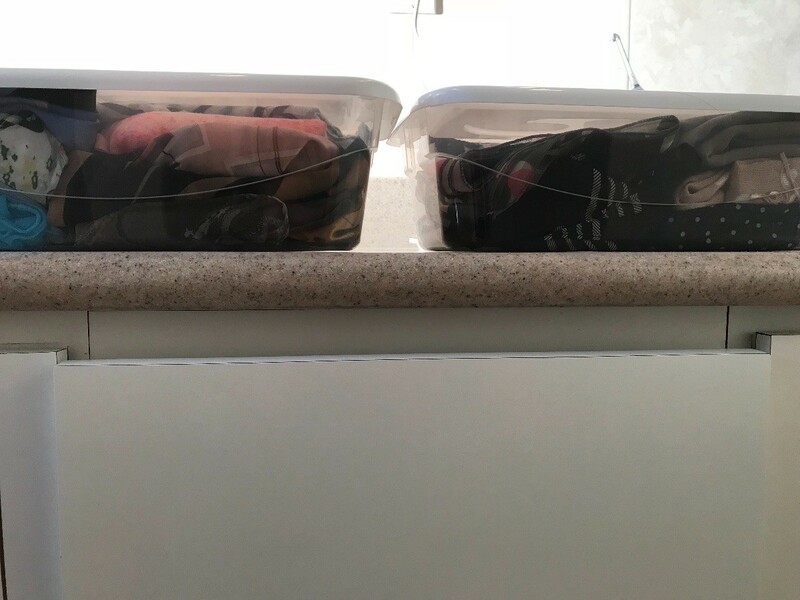 To keep them tidy and clean, I store them in plastic covered shoe boxes, available at the Dollar Store. I can easily locate the scarf I want. I own a lot of scarves but could never find one when I needed it until I made this great scarf organizer which can also be used for necklaces or men's ties. Each spring and summer, most dollar stores sell dark green hanging metal "baskets" that are meant to be lined with moss, then hold hanging plants outside (I got mine at Dollar Tree). These baskets have spaces that are to large to hold anything, without moss or a planter inside them. Mine has 9 thick vertical wires that are set between a top and bottom ring of wire and 3 chains hooked to the top to hang it from. I decided to hang it in an unused corner of my bedroom from a tiny cup hook in the ceiling with a second identical basket hanging under it. I just love it! I drape my scarves around the vertical wires. But what's great is I can easily spin them around to see the scarves hanging in back. I also keep some of my scarves and soft headbands inside the baskets for even more storage. I have about 20 scarves hanging and there's still room for more! All stashed in an unused corner of my room. I make lots of scarves each year, really wide ones, out of fleece from Walmart. We really enjoy them a lot. I have found that they decorate the chair really beautifully. This gives our living room a more colorful look. The scarves are ready to untie from the chair the second we are ready to go, since they are right near the front door. To organize or display scarves, loop them through colorful, plastic bangle bracelets that are not being worn and then hang them on a hook or coat tree. I have an increasing number of scarves and wraps. What is a good way to store them so they don't get too crushed? Put them on a hanger in your closet. Measure the back of a door. Sew a large piece that fits inside it, leaving lots of space for knob etc. You will have a large rectangle. Use upolstery fabric as it has some weight and will hang straight. Look for ends and pieces. Put 3 cup hooks on door , measure them one for each corner and one for the middle. On the fabric use a grommet maker and put three grommets in the fabric so they will hang on the cup hooks. Now, that is finished, you go to a fabric store or department and purchase rings, I use wooden rings about 1 1/2 " size or larger as you see fit. Measure and mark with chalk and stitch the rings to the fabric, I put them 6 inches apart up and down and across. They make a really cool big hanger with lots of holes in it just to hold scarves. I bet you could find one at Bed, Bath and Beyond or in one of the junk catalogs like Carol Wright, Harriet Carter or Miles Kimball. Good luck! I organize by color, fold in half and use pants hangers to hold them. I have a lot of scarves, probably 12-15 or more, and need a good way to store these lovely splashes of color, in my closet, hopefully. Ideas? I use clip clothes pins and a regular hanger. 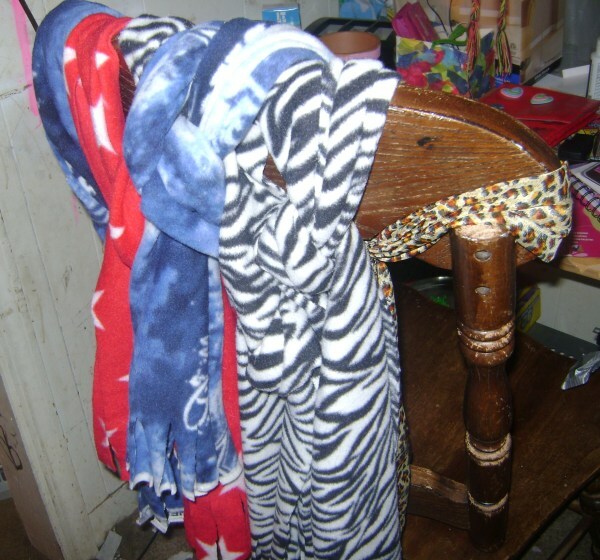 Clip the scarves to the hanger by a corner to prevent wrinkles. This makes it easy to arrange the scarves by color or size and whatever system you choose. I'm thinking of using shower curtain clips - the circular ones. Slip them on a hangar and then thread a scarf through each one - easy to remove, easy to put back. I roll my scarves up and shove them through toilet roll or wrapping paper tubes. This leaves them relatively wrinkle-free yet easily seen. I have well over 50 scarves so one drawer is dedicated to them. Opening the drawer always brings me joy for it looks like a flower bed in full bloom. I "lined" the drawer with felt so nothing would snag. I do the same thing for gloves.